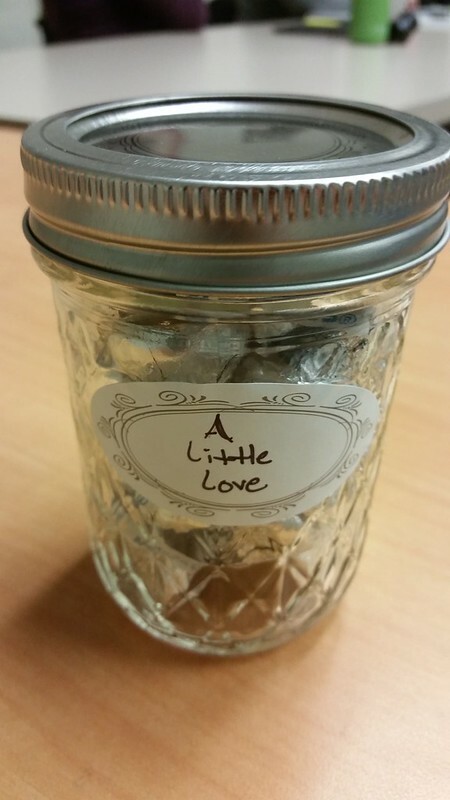 A small jar filled with Hershey Kisses and the words "A Little Love" on the label. This was a gift given to me and others in my cohort at UMASS Boston by one of our cohort members. It was a small but kind gesture that we all appreciated and needed at this point in the semester as it's been an intense semester of regular work and personal life and then the doctoral program on top of it all. We'd all been feeling it in some capacity or other. Which brings me to today--Thanksgiving and being thankful and grateful. There's a lot of different people in my life that provide "a little love"--though that little, always feels like a lot. I little love is like a little bit of sky. If you cut up the sky and gave out little pieces, your piece might be a 4' by 4' piece of the viewable sky, but within that piece, there's depth for you're not looking at a two-dimension bit of the sky, but you're literally looking at a window into the depths of the universe. That bit of sky that would be yours go far far far into the universe and I think in some ways, that's how love can work. On its surface it might be small, but it represents a larger depth of humankind. So I'm thankful for all the small gestures with great depths that the people in my life bestow upon me and hopefully, that I return in kind.